An organic dairy farmer from down under finds a way to make a living in the midst of an ugly milk price war. In a land never meant for cattle grazing, dry for years on end, Australian dairy farmers always had to be inventive to survive. In recent years, problems on the land have been the least of their worries. With the industry battered on one side by a brutal supermarket war that has driven prices down to levels not seen since the early 1990s, and on the other by a global milk surplus and a too-high Australian dollar, even the biggest players have thrown their hands up in despair. From the outside, it seemed like nothing short of time travel could get the industry back to a place where farmers could make money. But not everybody has given up – outside of Melbourne, farmers like Wayne Somerville of Jonesy’s and Simon Schulz of Schulz Organic have carved out sustainable futures in the wreckage of the industry by making up their own rules, and changing the way the game is played. Australian food producers have found themselves held increasingly tightly in the grip of an effective supermarket duopoly. Two retailers, Coles and Woolworths, dominate the industry and wield enormous power over pricing. In the milk fridge, their race to the bottom has turned into all-out war. Traditionally strong brands have suffered as the Big Two have stocked their shelves with private label products produced on razor-thin margins. In 2011, the retail price of own-brand milk, accounting for over 50 percent of all milk sold on their shelves, dropped to one dollar per liter. Back at the farm gate, only 29 cents for each of those liters made its way into the honesty box. Wayne had been in the dairy industry for four decades when he faced the stark reality of a failing business. He had a decision to make – change everything about how he worked, or get out. 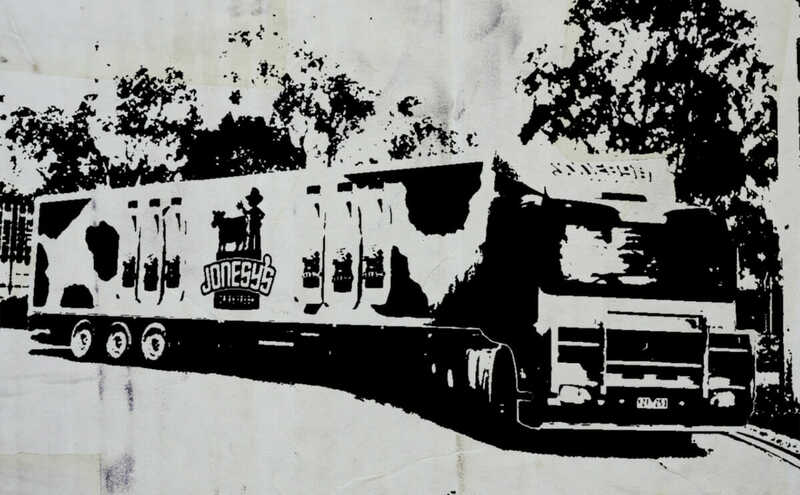 He and his 1,800 cows washed their hands and hooves of business as usual, and under the brand Jonesy’s,” set about supplying milk directly to small supermarkets, milk bars and cafes. Wayne’s milk is still bottled offsite on contract, though he hopes to take control of this last part of the process in the near future. Before he had any sales, the processor required a minimum order of 4,000 liters, leaving him with the near-impossible task of offloading it before it soured. This became a Christmas miracle of a marketing opportunity, as he sent his kids knocking on the doors of a nearby city, Bendigo, giving it away to anybody who answered. One way to beat dollar milk, Wayne suggests, is with a smile and a lot of free product. “Farming itself may not be super profitable, but processing can be,” says Simon Schulz, whose organic dairy in Timboon, on the south coast of Victoria, produces just under a million liters a year, as well as a line of cheeses, yogurts and cream, all processed on-farm. As winter rolls in, supplies are running low, and the high-end cafes in Melbourne, who adore his product, are struggling to get hold of enough. For Simon’s business, the dairy industry’s hard times have been, perversely, a blessing. It’s easy for a farmer already working in organics to point out how much simpler life can be if you throw out the rulebook, but in an industry where daily struggles are defined by debt as much as they are by the needs of cows, turning to organics and taking control of sales processes isn’t as simple as all that. However, as demand for Simon’s milk is exceeding supply and he looks to bring new producers on board, he sees enthusiasm for change coming through in the next generation. Though, Simon says, he would love to be “as successful as his grandfather was” on the farm, he’s not trying to prove anything. When he is doing well, and employing people in production, it has the happy side effect of bringing energy, and jobs, to the local Timboon community. Dairy Australia’s 2013 Situation Report paints a bleak picture of a struggling world market, “challenging” production conditions, and low morale across the board. There is some hope to be found in the supermarkets’ promises to work on increasing the farm gate price, and in experiments with purchasing directly from farm cooperatives, bypassing the multinational producers, but for Wayne, the Jonesy’s model insulates him from all of this. It’s rough work, but when asked if he’s happy, he can only laugh.